The ESI Nail Care program is designed to provide the student with the necessary requirements needed to pass the Georgia State Board of Cosmetology examination as well as prepare them for an entry level position in a salon or spa. The need for professional Nail Technicians to provide creative artistic, healthy and beauty solutions for the nails is growing significantly and our objective is to assure we train and educate the top candidates in the industry. ESI Nail Care Program is a hands-on instructional class, teaching you the basics of a manicure, pedicure, Gel polish manicure, Nail Enhancements, Creative nail art, and the latest nail trends in the industry. The Nail Care program is designed to provide knowledge in all phases of nail care industry by allowing the student to perform services in a state of the art nail spa environment. 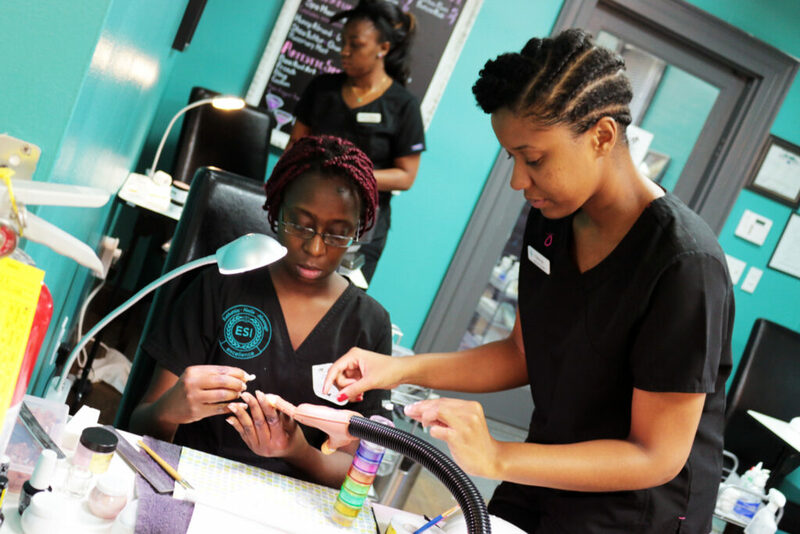 The ultimate objective for the ESI Nail Care program is to prepare students to meet the Georgia State Board of Cosmetology requirements and to become a professional licensed Nail Technician. ESI offers an exciting the 600 hour nail care program for licensure where you can become a nail technician in 6 1/2 months – 8 months. The ESI dynamic nail care program is facilitated in a state of the art Nail Spa and Aqua Lounge. Learn the latest trends in nail care. Tuition and fee payments may be arranged on a weekly or monthly basis. The first payment is due on the first day of class, and on the 10th day of each month thereafter. Students will receive an ESI Hoodie, an equipment bag, and a nail kit with all the necessary instruments and materials to perform the required services. When student has completed Level 2 requirements, they must pass an evaluation with a score of 75% or higher to graduate. After a student completes 600, services, exams and fulfills all financial obligations to the school, a certificate will be awarded. Completion time depends on the schedule the student chooses and attends regularly. Based on a 27.5 hour per week schedule, the normal time frame of completion would be 6 1/2 months or 22 weeks. The other schedule is a 19.5 hour per week schedule so the normal time frame of completion would be 7 months or 31 weeks.